VioStorm incorporates Wildfire’s brand new Trias™ intuitive 3-button digital control and monitoring system. It includes DMX, RDM, and a whole lot more, for ultimate intuitive control. Unique 3-button interface provides intuitive access to all available options and configurations. Capacitive touch switching, for greater responsiveness and longer life. Highly contrast OLED display, for greater visibility in both darkness and bright sunlight, and readable even from extreme angles. Universal control processor works in all Wildfire fixtures (fluorescent, metal halide, and LED), so you only have to learn one control system to manage all fixtures. DMX and local control of all available fixture special effects and their settings. Universal Voltage (100-240 VAC / 50-60Hz). Premium quality 365nm UV-LED emitters. Unlike many competing products, these LEDs produce no visible yellowtail—a shortfall that requires secondary filtering resulting in a loss of UV output as a result. Optically clear molded silicone optics that do not degrade or yellow when exposed to high levels of UV, unlike lower cost plastic optics. 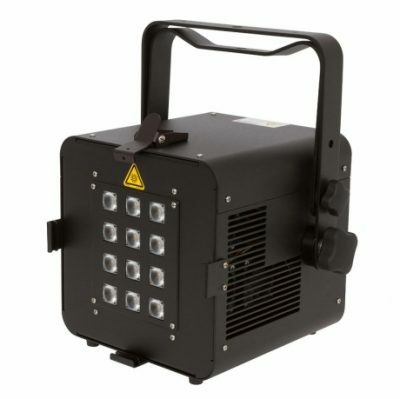 A unique interchangeable optics system that enables you to configure beam angles to whatever you need, whenever you want, giving you multiple fixtures in one. High-quality industry-standard Neutrik and Amphenol connectors for all DMX, Data and Power connections for more secure, reliable, and maintenance-free connections. Industry leading SinkPAD™ thermal management technology keeps the LEDs running consistently cool, which extends their life. Heavy-duty aircraft-grade aluminum housing with stainless steel hardware for maximum toughness and durability. Easy to service: simply remove the top cover and all components are easily accessible. Even the wiring connectors are removable and reusable without tools or crimping.